After long lengthy discussions, we have studied such a lot about wind energy and wind farms. Now let us think about the wind turbines that are seen in the wind farms. So wind energy is a clean and renewable source of power! Something as simple as wind turbine fixed on your roof top could cut your electricity expenses considerably! There is a lot of wind constantly blowing around your place! This article be a guide for home wind turbines which gives us a clear picture as to how to select the size of turbines for home, parts of home wind turbines, its maintenance, types of home wind systems, its speed etc. Who wouldn’t want an eco-friendly solution to their rising energy bills? Can we use wind energy to power our homes? The answer is ‘yes’! Small wind electric systems can make a significant contribution to our energy needs but it needs to be planned carefully. It is suitable for remote off Grid locations where conventional methods of supply are expensive or impractical. Depending on the wind resource a Home Wind Turbine can lower the electricity bill by 50-90%, prevent power interruptions and is non-polluting. You must decide how much electricity you need to produce, i.e if you want to supplement the electricity already provided or if you want to go off grid completely. Is your home energy efficient? Reducing your energy consumption will reduce the size of the wind turbine you need. Tall towers must be allowable in your area, 30 feet above the nearest tree or building and 300 feet away from any obstruction on the ground. There are restrictions for tall structures permitted in residentially zoned areas such as a height limit of 35 feet. Neighbours may object to a structure that blocks their view or be concerned about the noise produced by the turbine. The noise level of modern HWT is around 52-55 decibels. This is a long term investment and one must be prepared for this. Making your home energy efficient will reduce the size of the wind turbine you need and is more cost effective. Reduce heating and cooling needs by properly insulating your home. Take note of your windows. Special double paned, gas filled low emissivity coated windows reduce heat loss in cold climates and spectrally selective coatings reduce heat gain in warm climates. Maintain and upgrade your heating, ventilation and air conditioning systems. Use fluorescent lights instead of regular ones. Use energy efficient appliances approved by the US Environment Protection Agency. Depending on the purpose and amount of energy required the size of the HWT can vary. Small turbines of 20 – 500 watt can charge batteries of recreational vehicles and sailboats. 1-10kW turbines are used to pump water. 400watts to 100kW turbines are available depending on amount energy you need to generate. One needs to set out an energy budget. A typical home uses 10000 kW-hours of electricity a year. Depending on the average wind speed in the area a wind turbine rated in the range of 5-15 kW would be required for this need. 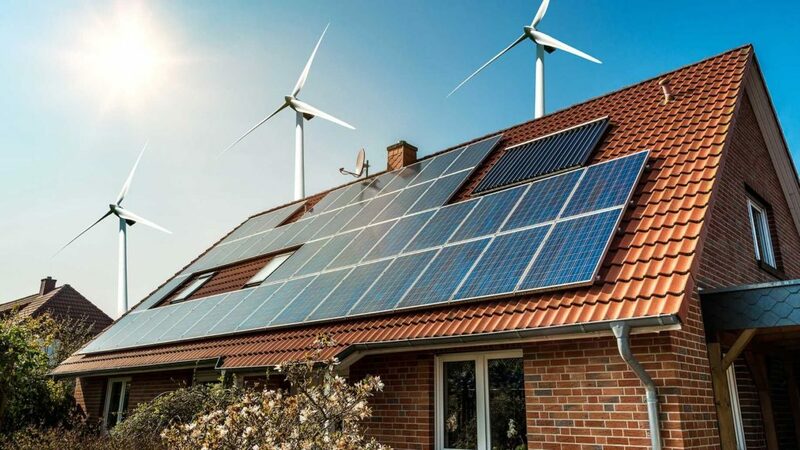 Electricity generated will be used to power the inverter connected to the grid and so turbine must be able to produce additional energy to supply the home needs as well. All manufacturers test their turbines in wind tunnels with regulated wind speeds blowing continuously. Therefore it is important to remember that the information provided by the manufacturer may not be entirely reliable in natural conditions where wind is intermittent and wind speeds vary during the day and year. The rotor, generator, tower, wiring, and Balance of system components such as controllers, inverters and batteries make up the complete wind turbine. The spinning blades are 3 in number and are made of fibreglass mainly. The diameter of the rotor defines its swept area and the amount of power produced. It captures the kinetic energy of the wind and converts it to rotary motion to drive the generator. Most turbines are horizontal axis upwind machines. The tail keeps the turbine facing into the wind. The rotor, generator and the tail are attached on the turbine frame. The tower of height at least 30 feet above neighbouring obstacles ensures the turbine is in a space to access stronger winds and avoid the turbulence closer to the ground caused by hills, buildings or trees. Relatively small investments in increased tower height can yield high rates of return in power production. The two main types of towers are the self-supporting (freestanding) and the guyed towers. Most home wind turbines use guyed towers. Guyed towers consist of lattice sections, pipe or tubing and supporting guy wires. Aluminium should be avoided as it damages easily. Guy radius must be one half to three quarters of the tower height. Tilt down towers is more convenient as they help to lower the turbine and therefore make it easy to maintain. During stormy or hazardous weather they can be lowered to protect the turbine too. Mounting turbines on roof tops must be avoided. Vibrations from the turbine get transmitted to the structure and can cause structural damage to the building. Noise from the turbine will also cause disturbances. There are other parts of a turbine in addition to the mounted turbine and the tower is called the ‘Balance of System’. The parts include a controller, storage batteries, power conditioning unit or an inverter and wiring. The batteries are used to store excess power for use when the wind is calm. Batteries contain corrosive and explosive chemicals. Hence these must be kept away from the living areas. They also need to be protected from temperature extremes. The charge controller keeps the batteries from overcharging. Small wind turbines generate DC electricity. The Inverter converts this into AC electricity which is used by standard conventional appliances. Though the inverter reduces the overall efficiency of the system, it is a necessity. It is a must in grid connected systems. Annual maintenance of the Wind turbine is necessary. Bolts and electrical connections should be checked and tightened if necessary. Blades or bearings may need to be replaced after 10 years. How to asses wind speeds at site? Obtaining average wind speed information from a nearby airport – This may not be reliable as local terrain influences may cause differences in wind speeds at the airport and the proposed site. Observation of the area’s vegetation – A deformity called ‘flagging’ occurs on trees, especially conifers and evergreens, caused by strong winds. This can be a permanent deformity ranging from flagging to throwing to carpeting, and can help to roughly estimate the average wind speed for an area. Length of the wire running between the turbine and the house. Electricity can be lost due to resistance in the wire if the wire is too long and this occurs more for DC current. Here your HWT is connected to the electricity distribution system or grid. The excess power generated by your system is transferred or sold to the grid. The output has to be AC current. Hence power conditioner unit is required. Batteries may not be needed. If the turbine cannot fully supply your requirement the utility makes up the difference. There are good incentives for the sale of excess electricity or for the purchase of wind turbines. This is suitable if you live in an area where utility supplied electricity is expensive. Also consider if connecting your system to the grid is not expensive. Net metering programs- If your generator is producing more energy than you need, your electric meter will be allowed to turn backwards. Your power generation can offset your consumption over the entire billing period and receive retail prices for more of the electricity you generate. Net metering varies by state and by utility company. Safety – The installation and operation of your wind turbine is subject to the electric codes of the local government. These emphasize proper wiring and use of components certified by the fire and electrical safety by approved testing laboratories. The wind sourced power delivered to the grid must match it in terms of voltage, frequency and power quality. If you have a grid connected wind turbine, it should automatically stop delivering electricity to the power line during a power outage. Otherwise it could result in deaths of line workers who might start work on a live line thinking it is ‘dead’. These wind systems are not connected to the utility grid and hence excess power is stored in batteries. These are suitable for remote places where it is very expensive to be connected to the nearest utility. These systems should be able to produce all the electricity required for the house and or farm. A hybrid system combines wind and solar energy technology. This provides reliable off grid power for homes, farms and sometimes entire communities. This is especially useful in the US where wind speeds are low in the summer when the sun is hot for a longer period. The wind is stronger in the winter when less sunlight is available. When neither is available the batteries provide the power. A generator using diesel can also be incorporated for additional power. The storage capacity of the hybrid system must also be sufficiently large. Before buying , it is good to review different systems and find which one is best suited for your needs. Make sure that spare parts and service will be available when needed. Also enquire with other system owners about performance, reliability, maintenance and repair requirements and fulfilled expectations. It is better to get the wind turbine installed by a professional installer who is also a licensed electrician than trying to do it alone. As long as one is fully informed, wants to gain energy independence and generate clean power, wind energy can power your home!